The use of clear material to magnify objects dates far back in history, but the first illustration of lenses for glasses dates to about 1350. Magnifying glasses for reading predate that illustration, dating back into the late 1200s. Despite these early uses of lenses, the discovery of the microscopic world of bacteria, algae and protozoa waited almost 300 years. One difference between a magnifying glass and a compound light microscope is that a magnifying glass uses one lens to magnify an object while a compound microscope uses two or more lenses. 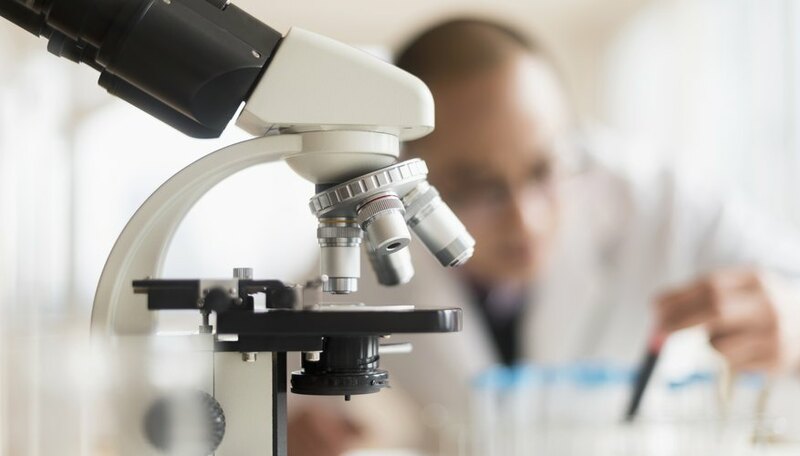 Another difference is that magnifying glasses can be used to view opaque and transparent objects, but a compound microscope requires the specimen be thin enough or transparent enough for light to pass through. Also, a magnifying glass uses ambient light, and light microscopes use a light source (from a mirror or a built-in lamp) to illuminate the object. Magnifying lenses have been used for centuries. Starting fires and correcting faulty vision were among the earliest magnifying glass uses and functions. Documented uses of lenses began in the late 13th century with magnifying glasses and spectacles to help people read, so the association of glasses with scholars dates to the early 1300s. Magnifying glasses use a convex lens mounted in a holder. Convex lenses are thinner on the edges than in the middle. As light passes through the lens, the light rays bend toward the center. The magnifying glass is focused on the object when the light waves meet at the surface being viewed. A simple microscope uses a single lens, so magnifying glasses are simple microscopes. Stereoscopic or dissecting microscopes usually are simple microscopes as well. Stereoscopic microscopes use two oculars or eyepieces, one for each eye, to allow binocular vision and provide a three-dimensional view of the object. Stereoscopic microscopes may have different lighting options as well, allowing the object to be lit from above, below or both. Magnifying glasses and stereoscopic microscopes can be used to view details on opaque objects like rocks, insects or plants. 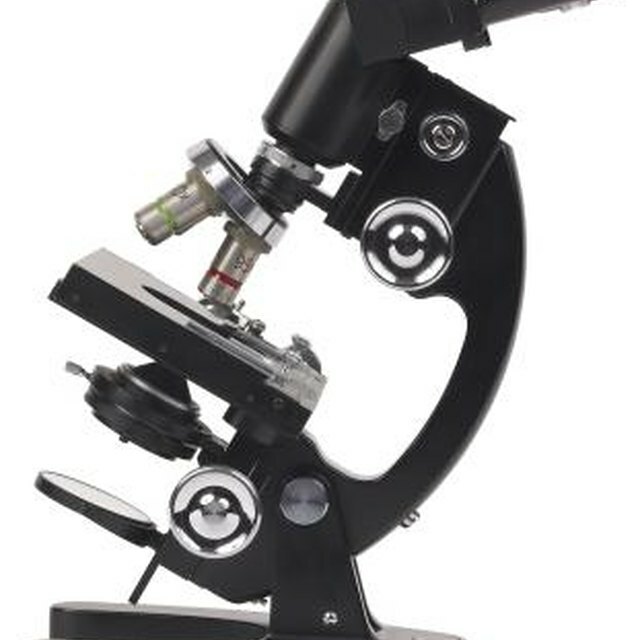 Compound microscopes use two or more lenses in a row to magnify objects for viewing. In general, compound microscopes require that the specimen to be viewed is thin enough or transparent enough that light can pass through. These microscopes provide high magnification, but the view is two-dimensional. Compound light microscopes most commonly use two lenses aligned in the body tube. Light from a lamp or mirror passes through a condenser, the specimen and both lenses. The condenser focuses the light and may have an iris that can be used to adjust the amount of light passing through the specimen. The eyepiece or ocular usually contains a lens that magnifies the object to look 10 times (also written as 10x) larger. The lower lens or objective can be changed by rotating a nosepiece that holds three or four objectives, each of which has a lens with different magnification. Most commonly the objective lens strengths have four times (4x), 10 times (10x), 40 times (40x) and, sometimes, 100 times (100x) magnifications. Some compound light microscopes also contain a concave lens to correct for blurring around the edges. Never use the sun as a light source if using a compound microscope with a mirror. The sunlight focused through the lenses will cause eye damage. Compound light microscopes usually are brightfield microscopes. These microscopes transmit light from the condenser below the specimen, making the specimen look darker compared to the surrounding medium. The transparency of the specimens can make details difficult to view because of low contrast. Specimens, therefore, often are stained for better contrast. Darkfield microscopes have a modified condenser that transmits light from an angle. The angled light provides greater contrast to see details. The specimen looks lighter than the background. Darkfield microscopes allow better observations for live specimens. Phase-contrast microscopes use special objectives and a modified condenser so that specimen details show up in contrast to the surrounding material, even when the specimen and the surrounding material are optically similar. The condenser and objective lens amplify even slight differences in light transmission and refraction, increasing the contrast. As with the brightfield microscopes, the specimen appears darker than the surrounding material. The difference between hand lens and microscope magnifications comes from the number of lenses. With a magnifying glass or hand lens, the magnification is limited to the single lens. Since the lens has one focal length from the lens to the focus point, the magnification is fixed. In 1673 Antony van Leeuwenhoek introduced the world to his tiny "animalcules" using a simple microscope or hand lens with a magnification of 300 times (300x) actual size. Although Leeuwenhoek used a bi-concave lens that provided better resolution (less distortion) of the image, most magnifying glasses use a convex lens. Finding magnification in compound microscopes requires knowing the magnification of each lens that the image passes through. Fortunately, the lenses usually are marked. Common classroom microscopes have an eyepiece that magnifies the object to look 10 times (10x) larger than the object's actual size. The objective lenses on compound microscopes are attached to a rotating nosepiece so that viewers can change the level of magnification by rotating the nosepiece to a different lens. To find the total magnification, multiply the magnification of the lenses together. If viewing an object through the lowest power objective, the image will be magnified 4x by the objective lens and magnified 10x by the eyepiece lens. The total magnification will therefore be 4 × 10 = 40, so the image will appear 40 times (40x) larger than the actual size. Computers and digital imaging have greatly expanded the ability of scientists to view the microscopic world. The confocal microscope technically could be called a compound microscope because it has more than one lens. The lenses and mirrors focus lasers to produce images of illuminated layers of the specimen. These images pass through pinholes where they are digitally captured. These images then can be stored and manipulated for analysis. Scanning electron microscopes (SEM) use electron illumination to scan gold-plated objects. These scans produce three-dimensional black and white images of the exterior of objects. The SEM uses one electrostatic lens and several electromagnetic lenses. Transmission electron microscopes (TEM) also use electron illumination with one electrostatic lens and several electromagnetic lenses to form scans of thin slices through objects. The black and white images produced appear two-dimensional. Lenses predated the earliest records of their use in the late 13th century. Human curiosity almost demanded that people noticed the ability of lenses to examine very small objects. The 10th century Arab scholar Al-Hazen hypothesized that light traveled in straight lines and that vision depended on light reflecting from objects and into the viewer's eyes. Al-Hazen studied light and color using spheres of water. However, the first picture of lenses in spectacles (eyeglasses) dates to about 1350. The invention of the first compound microscope is credited to Zacharias Janssen and his father, Hans, in the 1590s. In late 1609, Galileo turned the compound microscope upside down to begin his observations of the skies above him, permanently changing human perception of the universe. Robert Hooke used his self-built compound light microscope to explore the microscopic world, named the pattern he saw in cork slices "cells" and published his many observations in "Micrographia" (1665). Studies by Hooke and Leeuwenhoek eventually led to germ theory and modern medicine. G, Karen. "What is the Difference Between a Magnifying Glass and a Compound Light Microscope?" Sciencing, https://sciencing.com/difference-glass-compound-light-microscope-8611655.html. 29 November 2018.